Karst Worlds: Message to Obama: Save the Bats! Message to Obama: Save the Bats! Do you want to help save America’s insect-eating bats from extinction? Then tell President Obama. People who love bats — or at least the multi-billion dollar agricultural benefits they provide — are urging Obama to include in his 2013 budget research on White Nose Syndrome, the disease that’s annihilating insect-eating bats across much of the eastern United States and Canada. Caused by a fungus that was first identified less than a decade ago, scientists are racing to learn how to fight WNS. Federal research funding, however, has been minimal, with bat supporters scratching and clawing for the Beltway equivalent of couch change. To ask for direct White House support, Bat Conservation International has set up a We the People online petition. We the People is the formal White House petition site, with a response promised to any plea with at least 25,000 signatures to back it. Of course, with governments and families in belt-tightening mode, bats might not seem a pressing concern. But bats are worth a lot of money. They’re nature’s own nocturnal insect-eating machines, provided free of charge and worth at least $3 billion to U.S. agriculture. Of course, that’s hard to estimate; the value might be as high as $54 billion, without even including forestry benefits. Federal support also means jobs. Money for White Nose Syndrome research doesn’t disappear down a cave. It goes to technicians and field assistants and other hard-working Americans struggling to get by. And if utilitarian reasons don’t inspire you, then bats are just plain cool. They’re the fuzzy, warm-blooded occupants of the same niche filled by birds in daytime. They can live for decades, fly with uncanny grace, and communicate in ways we’re just beginning to understand. People sometimes think that evolution or other natural processes will fix the White Nose Syndrome problem. Bats will evolve resistance, or something else will consume the bugs they would’ve eaten. That’s true, but only if you’re willing to wait a few thousand years, maybe longer. If you’re not, then sign this petition and spread the word. 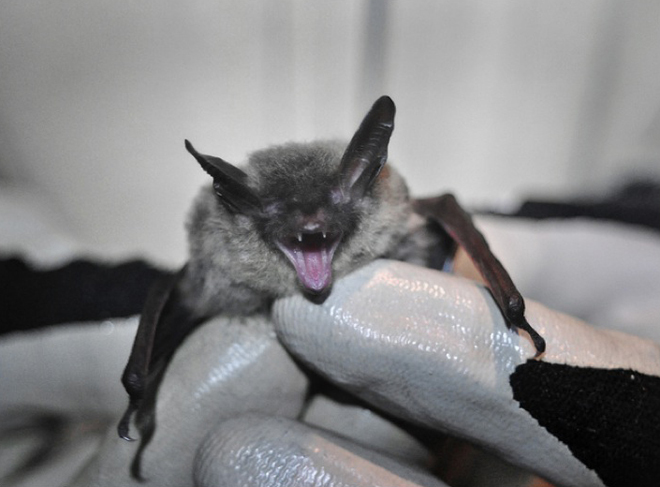 CSI Wisconsin: Are Wind Turbines Killing Bats?